From conversations with the other participants, it was clear that most of us came to Mykonos with little idea of what we might be able to take home from the four days of this conference. We shared a sense that the time was right to hold this ‘Mathematics and Narrative’ meeting, but wondered how people from such different backgrounds, with such varied relationships to mathematics, could speak meaningfully to each other. Reflecting after the event, what was so very striking for me about this conference was the variety of ways in which the material presented bore upon issues at the heart of philosophy. We heard stories of communities and institutions, the complex matrix in which mathematics has flourished or failed to thrive. 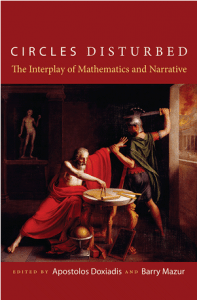 We heard stories of individuals whose mathematics framed their successful or tragic personal quests for meaning. We heard stories of ideas and concepts, the stuff of mathematics, and of their surprising adventures, their blending and propagation. And we heard stories of research programmes and traditions, torches passed on from one group of bearers to the next. So many threads of a yarn stretching back beyond the Greeks and Babylonians into prehistory, and pointing to an open future. To cast these themes as philosophical is not to engage in any form of disciplinary imperialism, a drive to claim as one’s own the totality of life-spaces touched by the course of mathematics through its long history. Mathematics is too vast by far to be circumscribed in such terms. This age-old practice could only reveal itself more fully by its entanglement with the concerns of historians, psychologists, scientists, writers, journalists, artists, film-makers, and theatre directors. The staging of the ‘Mathematics and Narrative’ conference allowed practitioners from these diverse constituencies to expose their efforts. By doing so it irrevocably established the need for an arena in which to share our struggles and triumphs. And we began to see how it might be possible to learn from each other. With this first meeting behind us, we can look forward to future meetings with a much clearer sense of what we can achieve together.